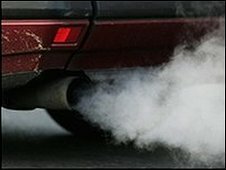 Researchers in Bath and Bristol are working to discover if carbon dioxide extracted from air could be turned to car fuel. A project aims to develop porous materials that can absorb CO2 and convert it into chemicals that can be used to create fuel. The idea is that the process would be powered by renewable solar energy. Bath University is working with scientists from Bristol University and the University of the West of England. The researchers hope that in the future, the porous materials could be used to line factory chimneys to take carbon dioxide from the air, reducing the effects of climate change. Dr Frank Marken, senior chemistry lecturer at Bath, said: "Current processes rely on using separate technology to capture and use the CO2, which makes the process very inefficient. "By combining the processes the efficiency can be improved and the energy required to drive the CO2 reduction is minimised. "It will be a massive challenge but we have a strong team that includes chemists, chemical engineers, biologists and life cycle analysts." The project involves researchers from Bath's Institute for Sustainable Energy and the Environment; the School of Chemistry at Bristol University; the Bristol Robotics Laboratory (BRL) and School of Life Sciences at the University of the West of England. Dr Ioannis Ieropoulos, of BRL, said: "One of the great advantages of this project is that it will exploit the natural abilities of micro-organisms to reduce CO2 in the atmosphere and at the same time produce electricity or hydrogen as required." Dr David Fermin from the University of Bristol said: "Currently, there are no large-scale technologies available for capturing and processing CO2 from air." The £1.4m project is funded by the Engineering & Physical Sciences Research Council (EPSRC).